May 1st, 2006 at 1:35 pm I enjoyed your website. It is really beautiful.I have a question for you. Let me give you some background: I am a direct descendant of Rev. James Fitch (1622-1702) on my mother’s side, and of Robert Turk (1690-1772) on my father’s side (hence my interest in your branch “Turks of Virginia”). I and others have run into a snag as to the surname of the spouse of one of our ancestors: James Turk (1719-about 1803), one of the sons of Robert Turk (1690-1772). Some resources show he was married to Mary Collier and some show he was married to Mary Kinkead or Mary Kinkhead. You show that James was married to Mary Kinkead. Do you have a family source for this information? What source caused you to choose “Kinkead” as the surname rather than “Collier”? 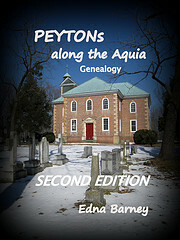 Jean – To answer your question, James and Mary TURK were mentioned in a land deed on 16 August 1762, in Augusta County. A few years later James Turk of Augusta County, Virginia was involved in a land deed in Albemarle County on 8 September 1768. On the deed his wife appears to be the daughter of David and Winifred Kinkead (Albemarle County, Virginia Deed Book 5, part 1, pages 17, 18). I have not seen this particular deed. I have accepted this James as the son of Robert TURK. On the 1785 Census of Albemarle County, Virginia, James Turk had five white souls and no buildings or dwellings. He was paid a Public Service Claim in said county before 13 June 1789. James Turk with 5 white souls was the only Turk in the 1785 census of Albemarle County. He also was the only Turk on the 1800 Tax List there. The only mention I have of the James TURK who married Mary Collier is from Helen Turk Watson's "Descendants of William and Margaret Archibald Turk". I have no sources for anything about him. 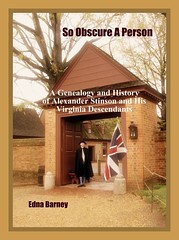 She said that he died in Carolina and the birth and death dates fit the James Turk of Albemarle, but I didn't find any references about this in her book. The James Turk of Albemarle had some connection to Carolina, as his daughter Elizabeth Finley TURK was educated there. She seems to have been his only child, as he left his landed estate to my ancestor when he died in Albemarle, leaving a will there. These Turks were from Pennsylvania before they came to Virginia, however there is record of many in this family going south to the Carolinas and returning to Virginia, so it is logical that James and Mary TURK may have done so too. And Mary KINKEAD may have been a second wife. I have no documentation for any children other than Elizabeth.